"Good afternoon! We thank everyone who has helped and is helping us! We wish you all the best, peace, love and good HEALTH !!! There are no major changes about Alisa. It's very little time left before the surgery and we still haven't got a half of what's needed for the treatment. We are asking you again to help Alisa, we have noone esle to ask! Supporting Alisa means giving her a chance to learn important basic human skills - stand, walk and eat independently. You can still help her by putting money on the mobile number + 375 29 244-54-43 - it will further be transferred to the charity account. Or transferring the money on the bank card of Belarusbank: 4255 2000 3893 0087 until 01\19. - Marchenko Alla Valentinovna. I'm hoping for people's help!!! Thanks a lot for your kindest support! " We support mother's words and ask you to contribute as much as you can: every little helps the child to make a big difference to her life. We are hoping for you! 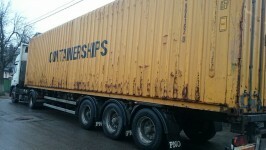 In April we have got another humanitarian aid load from Burren Chernobyl Project. We are happy to inform that all the documents are provided and the aid has finally reached its destinations. This time the aid went to Borisovskyi psycho neurological asylum, Tarasiki village, Cherven psycho neurological asylum, Yazovki village, Social service centres in Ushachi and Zavodskoi district, Minsk and Gorodische children’s orphanage. Full information with figures is to be found in the REPORT section as always. WE express our gratitude to everyone who helped by gathering, sorting loading the aid and organizing the truck delivery to our country! Thanks a million from those who got this necessary help! Today, on the International Children's Day, we would like to thank everyone who helps to support and protect our children with special needs residing both in families and in institutions. We thank our friends and sponsors Burren Chernobyl Project and their volunteers, Chernobyl Children's Trust and their volunteers, and also all those people who support Dobra tut projects! Together we can make lives of the children a bit better! We congratulate you on this day and say thanks a million! 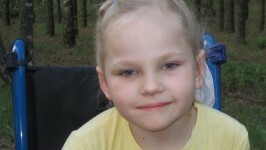 Family Markevich from the Grodno region is looking for to pay treatment for their daughter's disease in a specialized center "Olinek" Warsaw. The family earns enough funds to pay only for a part of the expensive treatment. Sofia's mother has the Rh-negative. And when the child was born the figures were quite regular: Birth weight of the child was 3300kg, height 52cm. The child was discharged the hospital almost healthy. At first, everything seemed to be with their daughter was fine. Sofia developed as all the kids, started to hold her head up at the age of one month, ate well, started "talking", smiling. At 5 months started to roll over on her tummy, but when it was time to sit, Sofia did not try to do that. We began to worry. At 6 months we went to the rehab in Lida (town in Belarus). Then spent a month at home doing exercises and then went back to the hospital up to 10 months of the child's age. At the age of 10 months, the doctor sent us to "Mother and Child"center of Minsk. And there finally Sofia finally leanrt sitting up on her own. There were many tears of joy, seeing our daughter doing it herself. But the doctor decided to do an MRI scan of the brain to find out what the problem of the development delay was. The results of the MRI brought a terrible diagnosis: Earlier organic brain damage resulting from the BOP (thinned corpus callosum, atypical radial direction grooves in the parietal-temporal areas, and cerebellum) delayed speech and psycho-motor development. All this time we have been fighting this disease. We went on treatment sessions in rehabs in the town of Lida, Grodno, Minsk, Brest, also in Lithuania. The results are positive. At the age of one year and three months Sofia started crawling on all fours, at the age of one year and seven stood up up in bed, at two years my daughter started to make the first steps. It's not so bad, but when Sofia turned 2 years and a half she started having convulsions. But, thank God, they did not bring her backwards in her development, she preserved all her skills. But because of the seizures we lost a lot of time. After the seizures went away we started treatments again. Being treated in Brest, Minsk, Lida. We twent twice to the dolphin therapy in Minsk, we went to Minsk for logopaedic massages in the "I speak" center. Every day we are doing exercises and get treatment with medication. A doctor in Minsk has recommended us to go to Warsaw for rehabilitation. The method is called Tomatis. We did one course from 5 January to 17 January 2015 and a second course of 2 March to 13 March 2015. The results are good, Sofiyka began to speak more words, short sentences (Bi Dad, Mom let itd), attentively, become better eat with forks itself became perseverance. 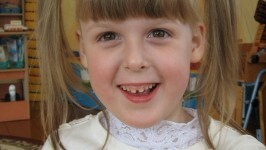 The speech and language therapis in the kindergarten said Sonia began to perform more complicated tasks. The third course is planned for31 August to 11 September 2015. The course fee is 8850 PLN. Between the second and third year there should be a break of no more than 6 months. And we need to be sure that the child keeps the old skills and gain new ones. Please do not pass our request by and give our daughter a chance to have a better quality of life. She will succeed! Today, my daughter can walk independently but the gait is unsteady. She vocab is quite ok, she can say: mom, dad, woman, grandfather, aunt, uncle, Bi (car), AA (for going to the toilet), give me, etc. She can copy the sounds of animals. Our daughter is kind, affectionate, cheerful, emotional, curious. Doctors say that we have achieved good results. We believe that our daughter will recover soon and start speaking better. We will be glad of any help!!! Please, help the child to get a chance for better life!!! We are kindly asking you to urgently help the family of Arsenyi Penkrat fundraise for Arsenyi's surgery. You can find his story (http://dobratut.by/ru/post/2015-03-24-lechenie-dlya-arseniya). 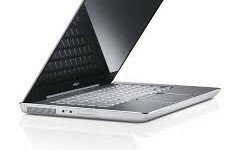 At the moment the family has about 7 000 dollars. We are asking you to help fundraise the rest of the money (about 2000 dollars) to cover the cost of the surgery. The parents agreed to do only the surgery now without the further rehab (that was recommended). The Penkrat family will be extremely happy to get any help!! Purpose of payment: Treatment for Arsenyi Penkrat. During the week before Easter five young people from Corduff community youth project as part of Foroige's youth citizenship program visited Cherven children's orphanage. 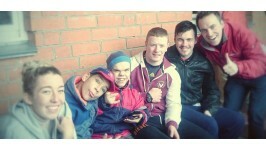 The group were joined by Deirdre Walsh, “Foroige” and BCP's Brian O'Sullivan. A fantastic week was experienced by all as the group spent time working across the different units and delivering organized activities such as a trip to the cinema. A number of local families were supported in the local community and Medication was also purchased for the orphanage by the groups fundraising. Deirdre Walsh who facilitated much of the trips planning said ' the trip had a very positive impact on the young people who travelled, an opportunity to experience another side of life and the work of the Irish charity'. Another group of nine volunteers went to Gorodische orphanage where they spent a lovely week with children trying to cover all the units and see all the children. Lots of games, parties, massage sessions. And sure lots of happiness for both children and volunteers! We thank our volunteers for the fantastic time they spent in the orphanages and those smiles that are most precious! "Dobra tut" is greatful to our donator Kiseliev Vladimir for regular donations towards Fund's projects. Treatment for Arsenyi urgently needed! His mother Tatiana is writing about her son who is very eill since he was born. She hope the people can help them to treat her little child! 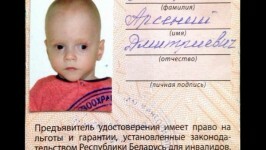 Little Arsenyi is 5 years old and he live in Minsk. He suffers from Cerebral Palsy and epilepsy. He also has hydrocephalus, but he had a surgery (had a shunt) to fix it. Also the child has spastic quadriplegia and symptomatic epilepsy, systematic speech and underdevelopment and dysarthria. The family was fighting hard to help Arsenyi improve. During all these years the family tried a huge number of treating methods: they spent time in all rehab centers in Belarus but it didn’t bring any good results, so they decided not to waste time there anymore and tried individual treatment sessions of Voitotherapy in Moscow. After that Arsenyi’s legs and arms relaxed a lot. They also tried reflex massage in MedC centre and after that the child started to turn from his tummy on his back. The family also went to Medical centre in Check Republic where the treatment was also very successful: the Arsenyi pronounced his first words Mama and Baba. But unfortunately in August the child had a major seizure which lasted for about 30 minutes and after that sometimes he is like “flies away” or sinks in his thoughts deeply. The doctors didn’t know if it was some sort of seizures or these were neurological consequences. Thanks to some kind people the family managed to fund raise money to go to Germany for 2 days monitoring that showed that Arsenyi has no seizures as such but he has some brain activity that blocks child’s development. But the fact that there are no seizures means a lot, the doctors even reduced the dosage of his medications. Unfortunately fighting CP is an extremely hard task. The orthopedist diagnosed pre-dislocation of Arsenyi’s hips and the child needs a surgery. To avoid a complicated surgery that involves complicated manipulations with bones and additional material to fix them the family found another way to help the child. The clinic in China, Beijing offered them Neurotomy which is easier to perform and to recover from. It costs 8.064 $. But after that Arsenyi will need 5-week rehabilitation which costs additionally. Total amount makes 18.151 $. And the family is expected to be there on the 1st of June! Surely for them this is an unbelievable amount. But they hope that there are good people that can put something towards Arsenyi treatment and that will surely help! She believes that together we can make a huge change in child’s life! We would appreciate your every help! Thanks in advance! 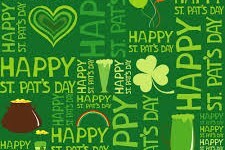 "Dobra tut" Cherity Fund wishes a happy St. Patrick's Day to all our freinds - Irish and not only! First of all we sending our best wishes to the sponsors, partners, donators, volunteers of Вurren Chernobyl Project, Chernobyl Children's Trust, and everyone who is involved into helping people of our country. And of course, our best wishes to everyone we support and to all our freinds! Diana is looking for friends! We are looking for your help! A family (single parent, no father!) from village Yazni, Vileiksy district, applied to us with such a thing: their 24 year old girl Diana Bogdan (31.01.1991) is looking for an opportunity to find new friends. As she lives in a small village and there are hardly any friends around and to get out from there regularly is extremely difficult because of her condition, she feels a bit lonesome. We will be extremely grateful! 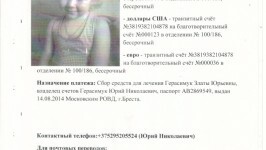 Help to girl Zlata is urgently needed! in attachements there are a few documents regarding the case that we have got from a family in Brest (they are in Russian apart from a few documents from the clinic in Germany in English too and the last one with the underlined accounts). Zlata Gerasimuk (DOB 12.10.2011) has a very rare heart condition since she was born (multiple heart defect, CAVC - defect of common atrioventricular canal and lots of secondary diagnoses). The child had an operation on correcting the lung arteria. The opereation was very complicated but the child survived! That helped the child to breath without suffocating with blood. The family was trying to go to the next step as there was still a lot to fix as some of the doctors would describe her heart as "a piece of swiss cheese". They were consultating with clinics in Russia and Poland as well as in Germany. And it turned out that the specialist in Belarus and Russia didn't have enough expertise to carry out the next operation. But one of the doctors in Germany agreed to undertake the responsibility! So the bill that the family got from the clinic that needs to be paid before 16 of February 2015 makes 44,900.00 Euro + 1600 euro per day in the general room in the hospital (the attendent is included), and 1000 euro if the additional equipment (like a wheelchair) is needed. So if there is any possibility to help in any way, please, see the account in euros underlined in black (Bank address is in a black box). So we are asking you to make a little contribution! Every little helps! Big thanks in advance on behalf og the family! We had an amazing group of Burren Chernobyl Project volunteers that were brave enough to come to Belarus in winter time. To add more to this they came at Christmas time! The week they spent in Gorodische orphanage was absolutely fantastic! ”I was as giddy as a child waiting for Santa on Christmas Eve the night before we left for Belarus. I’d been looking forward to this trip for so long and it was finally here! It was great to have mum there to make it all the more special. We hadn’t met our third Musketeer Amanda till we arrived at Dublin airport but it was like we were old friends by the time we’d reached London. The butterflies were dancing around in each of us and we just couldn’t wait to get there. Our first morning was the most overwhelming experience. 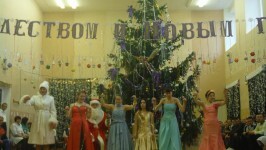 We walked through the beautifully decorated corridors and arrived into the gym where we were met by a gigantic Christmas tree and the excited faces of children from all the groups!! They were all dressed smartly or in costume as it was a rehearsal party for the big performance the next day when the Minister for Social Defence would visit. We watched some beautiful dancing by the older ones and a hilarious play where the children sang and danced their hearts out. Vova was dressed as Fr. Frost giving out presents of beautiful Christmas boxes filled with sweets. There were party games afterwards with everyone dancing and the turning on of the Christmas lights too. This all happened again the next day but with everybody fully dolled up – costumes and makeup and some different children got to come to allow for as many of them to get to see it as possible. Some of the girls from groups 3 and 4 were dressed in donated Communion dresses from the Irish with tinsel trimmings making the perfect Christmas party dresses! All the older girls were getting another outing in their debs dresses collected by Kathleen during the summer, they felt like princesses! We were delighted to be able to bring a group of 13 children to Baranovichi on Christmas Eve. The main reason was to get Andrei (G6) and Alosha (G2) fitted for glasses but of course we managed to squeeze some fun in too, we took them for lunch and went to see the huge Christmas tree in the middle of the town, sugared them up with ice-cream and let them loose in the arcade where we witnessed sheer and utter joy on their faces as they roared and shrieked with excitement! On Christmas morning we had a disco with groups 1, 2 and 6 where everyone danced to the best of their ability and of course, we had a few confetti and presents to give out at the end. We brought Fr. Frost to G4 with yogurts and sweets. This was extra special because many of these children weren’t able to take part in the main party earlier in the week. I saw smiles on faces I’d never seen smile before, it was such a heart-warming experience. We celebrated every birthday in the months December, January and February. We brought the infamous hats and glasses to each group and gave each of the birthday boys and girls presents. They were all delighted with the fuss over them. It was particularly nice because they wouldn’t normally have Irish there for their birthdays. We gave all of group 3 (cots and beds) foot massages and new socks. Did art with the group 7 embroidery girls. We took the rest of group 7 out two at a time to the classroom and spent some time with them there. Played board games, cards and danced with group 2 every evening. Even though we couldn’t play football with them it was nice to be able to spend that time with them as some of them are still working out on the farm in the cold weather and enjoy the company. We went to group 5 and came out wrecked as you can imagine! They’re still as lively as ever J There were quite a few from 5 in sickbay so we managed to visit them briefly one day to give them yogurts, cyrok and presents. We chilled with the Independents each night chatting over tea or playing a game of cards. They’re all doing brilliantly, those that may have been quieter in the past are beginning to find their voices and it’s great to see them all taking part! Over all it was a jam packed week full of festive fun. The children were in such high spirits, even the normally quieter ones were full of life. It was comforting in a way, to know that all this effort (decorations, parties and presents) is made every year even when there’re no important visitors such as the minister or other politicians. I definitely came home happier knowing this. We thank Ruth, Rosie and Amanda for the fantastic time they spent with the children – it’s the best present ever! Another load of humanitarian aid from Burren Chernobyl Project arrived in Minsk in late autumn 2014. After sorting out all the documents Dobra tut eventually distributed the aid from Ireland among the Institutions of Belarus. Clothes, shoes, bed linen, toys, etc went to the places that needed that most: asylums in Svir, Rakov, Stolbtsy (Kul village), some social service centers, etc. Full report on the aid that was delivered to the institution is provided in REPORT section. 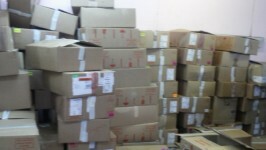 We thank everyone in Ireland who donated things who helped with loading the truck, did the documents. And surely we thank our ladies in Dobra tut who dealt with all the documentation (and not only) here on this side! Well done to everybody and thanks a million!